I used to hate project budgeting. I was afraid I’d mess up the numbers. Until I built my own project budget template. And here I’m sharing the template with you. Read the entire article before downloading it. In short, the template helps you stay organized and have 100% clarity on cost. By the way, the template works great in combination with my project plan template. If you haven’t checked it out, go get it! 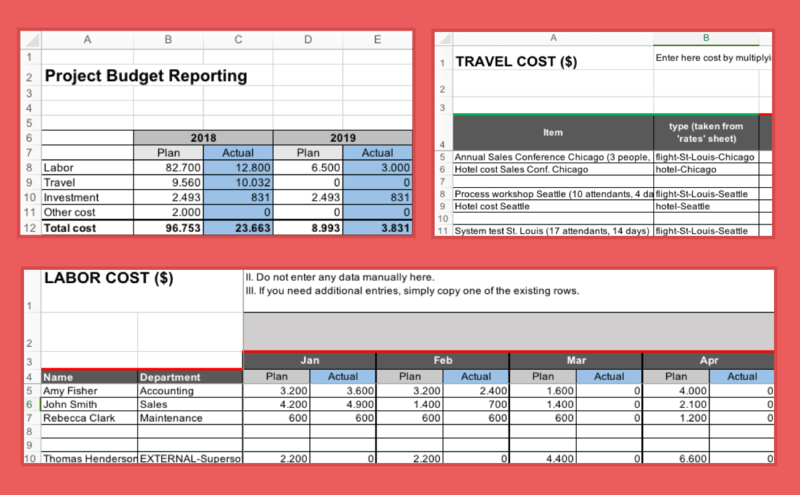 The project budget template is super-easy to use. The only specialty it has is that you can use standard rates to calculate labor and travel cost. It makes cost planning so much easier! You will understand why once you’ve read the next section. Setting up a project budget involves a lot of calculation. Not only do you have to estimate quantities (e.g. number of days), but you also have to put a cost behind each task and each item that’s used in the project. Without a good template this would mean a great deal of manual work. Luckily, I implemented a feature that will reduce the need for manual calculations to a minimum – and help you avoid errors at the same time. Here’s the feature: You can define default rates for resources used in the project, and thereby automate a huge part of the calculation. The rate-based calculation works for labor resources and travel cost. Why is the rate-based budgeting so useful? Instead of entering dollar amounts manually all across your spreadsheet, you can simply use a predefined rate as a placeholder. And if, for instance, you want to change the price of a flight ticket from $300 to $350, all you have to do is change ONE cell value (the default rate set in the rates tab). The Excel spreadsheet will pick up the new rate and update all related fields automatically. Let’s go hrough the template step-by-step. First we’ll take a look at each tab in the spreadsheet. The template will only calculate the cost of labor once you have maintained cost rates. Make sure you enter the same department identifier as in the Labor – effort tab. Daily rates should be defined both for internal and external resources. For internal team members these are of course “fictitious” (or imputed) values. For external services you enter the fee charged by the service provider per day. Here you can set default rates for flights, hotel stays and other travel-related expenses. Make sure you enter the same type as in the Travel cost tab. First, estimate how many days per month each of your team members will work on the project. Then enter this information in the below tab. Your planned efforts go into the Plan columns. The Actual columns is where you track the actual number of days spent. Amy Fisher will contribute 4 days in January and February, 2 days in March and 5 days in April. This tab is a 100% copy of the labor-effort view. The only difference is that it shows labor as cost, not days. Cost is calculated using the cost rates you defined previously. Each cost item must be given its own row. Hotel cost go in one row, airfare cost in another one and so on. Enter a description in column A. For column B, use the same type that you have used in the rates tab. The rate is pulled automatically into column C using the common description as a bridge. To calculate the cost for each item, a formula is used in columns D, F and onward. You can simply copy this formula to other rows. Any cost that is not labor, travel or investment, is tracked in the tab Other cost. Assume you intend to buy printing paper for $2’000. Then you would enter 2’000 in the month of purchase. Investments are goods that are purchased to be used in a company’s production process, where production can mean both manufacturing of physical goods or provision of services. Investment expenditures are not booked immediately at full cost. Instead the cost is spread over the lifetime of the item. For details on how to budget investment goods, talk to your accounting department. Let’s say your manager wants an update on the project cost. Then you can immediately pull this information from the project budget template, under the Reporting tab. Usually I just take a screenshot from the cost summary (see image below) and put it into whatever document I need it for: A management presentation or the project charter for example. If you want, you can also create a chart using the table above as data source. To analyze cost on a more detailed level, go into the tab of the respective cost category and compare plan vs. actual values. This can be done on monthly or yearly basis. I absolutely recommend you watch the video before working with the template. Thanks Ravikumar. Glad it was helpful for you! Welcome Vincent! I want to make project management as easy for you as possible. Thanks for the thorough tutorial: can you email the template to me, please? Sure. Go to the blue form above where you can enter your email address. Enter your details, confirm and you’ll be forwarded to the download page. Let me know if you have any questions re the template. I sent you the link to the download page by email. Let me know if it works.